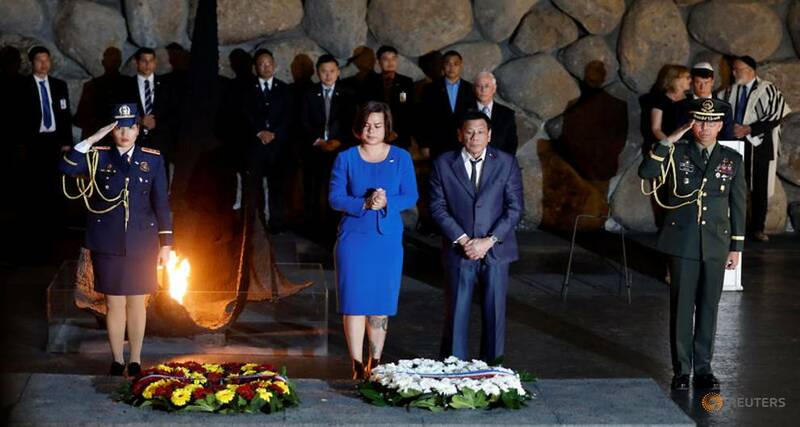 Philippines President Rodrigo Duterte, who has said he would be “happy to slaughter” his country’s drugs dealers on the scale of the Nazis’ Jewish genocide, on Monday laid a wreath to commemorate the Holocaust dead in Jerusalem. “May the world learn the lesson of this horrific and benighted period of human history. May the hearts of peoples around the world remain ever open. And may the minds of all men and women learn to work together toward providing a safe haven for all who are being persecuted.”, he has written in the museum guest book. "I could not imagine a country obeying an insane leader, and I could not ever fathom the spectacle of the human being going into a killing spree, murdering old men, women and children. I hope this will not happen again," he said. "There is always a lesson to learn: that despots and leaders who show insanity, they should be disposed of at the first instance," he said. That words are very true and if are coming from the hearth it could mean there is still a hope for Duterte who in the eyes of the world is such an insane leader waging drug war in such despotic manner. Will he convert and be saved from the wrath of the Lord? We will see if Phillipines will turn away from murdering people for using illicit drugs.